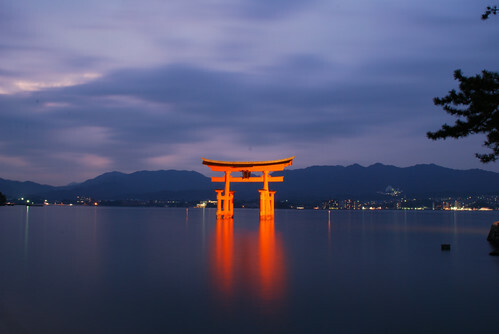 Miyajima at Sunset, originally uploaded by ZackTwin. This photo was taken during my vacation trip to Japan. The place is called Miyajima, which is a small island near to Hiroshima City. When I get to the island, it was about 4:00PM and the weather was cloudy. I was a bit disappointed because I wanted to take this giant torii gate with sunset view. Anyway, I took this photo after visiting nearby temples, when light of the gate on. With the light from the gate and the sky, I got this nice photo though I didn't have chance to take the gate with nice sunset. I rank this photo as the most favorite photo of Japan Trip, and also My Photo of 2009. Happy New Year 2010 and Happy 62th The Independence Day of Burma (Myanmar).